India is celebrating the 128th birthday of country’s Constitution architect and one of the greatest intellect who made possible the dream of a nation which is democratic, secular and progressive. Known worldwide as Babasaheb Ambedkar, Bharat Ratna Dr Bhimrao Ramji Ambedkar was the not only the flag bearer of Dalit activism in India, but has been one of the most influential person in uniting the unheard voices to get heard in a class-riched and segregated society where freedom of expression was a ‘taboo’. He helped the countrymen and women think logically and stand for issues that matter the most. On Sunday, when the entire nation (even worldwide) will celebrate the birthday of the most respectable man in the history on India, his teachings and ideologies will remind us all of how a distant dream of egalitarian society could have been fulfilled. People across the globe remember Dr Ambedkar as the social crusader who stood with and for the rights of the marginalised and underprivileged sections of the society, however, Babasaheb’s contribution is not merely limited to framing the Indian Constitution and standing with the Dalits. 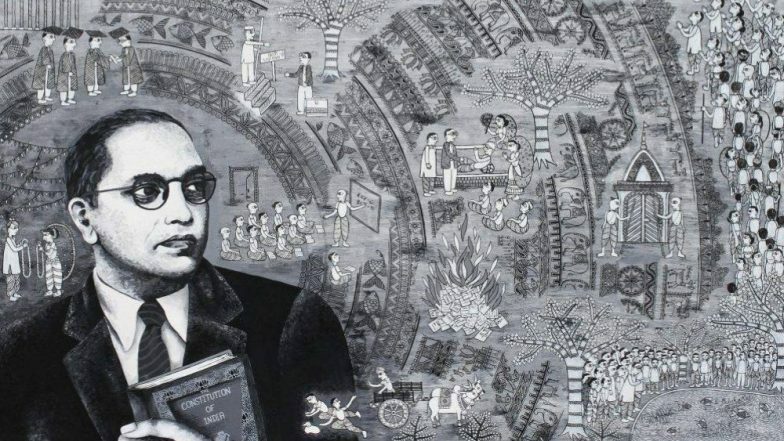 Ambedkar Jayanti 2019 Date and Significance: Know Everything About Bhim Jayanti on Dr Babasaheb Ambedkar's 128th Birth Anniversary. His journey of being raised in a family of 14 children in a Dalit family to getting a doctorate degree in economics from Columbia University and ‘Doctor All Science' from London School of Economics, to give the symbol of ‘Ashok Chakra’ on the Indian tricolour, Dr Ambedkar has been inspirational. Worldwide today, he and his teachings are the most read, written and researched topics. Renowned Columbia University in the United States of America has officially included Dr Ambedkar’s book – ‘Waiting for Visa’ – in their curriculum as a mandatory textbook and similar are the cases with other prestigious universities. Apart from authoring of the Indian Constitution, Dr Ambedkar had written a total of 32 books (10 are incomplete), 10 memoranda, evidence and statement, 10 research documents, review of articles and books and 10 preface and predictions. Dr Babasaheb Ambedkar Jayanti Quotes: Memorable Slogans From the Immortal Statesman of India. Born as the 14th child to a Mahar (Dalit) family of Ramji Maloji Sakpal and Bhimabai Sakpal in Mhow in Madhya Pradesh on April 14, 1891, Dr Balasaheb Ambedkar’s surname was changed by Devrukhe Brahmin teacher, Krishna Keshav Ambedkar, from ‘Ambadawekar’ to his own surname ‘Ambedkar’ in school records. It was initially changed to Ambadawekar from Sakpal by his father in school, meaning he comes from his native village Ambadawe in Ratnagiri district. In 1915, Dr Ambedkar completed his MA in Economics, with other subjects that included – Sociology, History, Philosophy and Anthropology. Also, presented a thesis, Ancient Indian Commerce. Then in 1916, he completed his second thesis, 'National Dividend of India – A Historic and Analytical Study', for another MA and finally he received his PhD in Economics in 1927 for his third thesis, after he left for London. In London School of Economics, Dr Ambedkar enrolled for a doctorate degree and at the same time enrolled for the Bar Course at Gray’s Inn. He completed his DSc in Economic in just four years in 1923 and was conferred honoris causa from Columbia (LL.D, 1952) and Osmania University (D.Litt, 1953). Other than his excellent academic record, Dr Ambedkar is known for his contribution to help Dalits in India getting and leading a respectful life, where rights are not a dream for them. Though being Professor of Political Economy in the Sydenham College of Commerce and Economics in Mumbai, objections were raised on him drinking water with the same jug other high-caste professors used. While practising law, Dr Ambedkar advocated for Dalits/untouchables being granted permission to get themselves educated. With an aim to promote education and socio-economic improvement, as well as the welfare of 'outcastes', the Dalit icon started five periodicals – Mooknayak (the leader of the dumb, 1920), Bahishkrit Bharat (Ostracized India, 1924), Samta (Equality, 1928), Janata (The People, 1930), and Prabuddha Bharat (Enlightened India, 1956). By 1927, Dr Ambedkar had decided to launch active movements against untouchability and publicly condemned the classic Hindu text – the Manusmriti (Laws of Manu) – for ideologically justifying caste discrimination and ‘untouchability’, and he ceremonially burned copies of the ancient text on 25 December 1927. This day still is celebrated as Manusmriti Dahan Din (Manusmriti Burning Day) by Ambedkarites and Dalits. Dr Ambedkar founded the Independent Labour Party in 1936, which contested the 1937 Bombay election to the Central Legislative Assembly for the 13 reserved and four general seats, and secured 11 and three seats respectively. Ambedkar was elected to the Bombay Legislative Assembly as a legislator (MLA). He even accused Mahatma Gandhi of writing in opposition to the caste system in English language papers while writing in support of it in Gujarati language papers, in his interview with BBC in 1955. Dr Ambedkar had twice become a member of the Parliament of India representing Bombay State in the Rajya Sabha, the upper house of the Indian parliament. When India attained Independence on August 15, 1947, the new Congress-led government invited Ambedkar to serve as the nation's first Law and Justice Minister, which he accepted. He was appointed Chairman of the Constitution Drafting Committee, and was appointed by the Constituent Assembly to write India's new Constitution on August 29. Have read the Constitution of over 60 countries, ‘The Father of the Constitution of India’ drafted the 'first and foremost a social document', which provided constitutional guarantees and protections for a wide range of civil liberties for individual citizens, including freedom of religion, the abolition of untouchability, and the outlawing of all forms of discrimination. His thoughts for extensive economic and social rights for women, won the Assembly's support for introducing a system of reservations of jobs in the civil services, schools and colleges for members of scheduled castes and scheduled tribes and Other Backward Class, a system akin to affirmative action. Today India's lawmakers bank on this highly researched and drafted (Constitution) to eradicate the socio-economic inequalities and lack of opportunities for nation's depressed classes through these measures. The Constitution was adopted on 26 November 1949 by the Constituent Assembly. In just 65 years of lifetime, the visionary icon had written a total of 32 books (10 are incomplete), 10 memoranda, evidence and statement, 10 research documents, review of articles and books and 10 preface and predictions. A knowledgeable person of eleven languages, Dr Ambedkar had even written a Pali dictionary. His ‘Waiting for a Visa’ (autobiography) is used as a textbook at Columbia University. 'The Buddha and His Dhamma' is the last book of Ambedkar. Apart from his honorary academic degrees and political career, Ambedkar was posthumously awarded India's highest civilian award, the Bharat Ratna, in 1990. Dr Babasaheb Ambedkar Jayanti: Remembering the Scholar, Social Reformer and Father of Indian Constitution. Though India lost its most precious jewel on December 6, 1956, Dr Ambedkar's academic work, social reforms and Indian Constitution will continue to remind us all what a magnificent icon was our Dr Babasaheb Ambedkar.